According to Wikipedia, the phrase “al fresco” has its origin in Italian, meaning “in the cool air ” -- but the Italians don’t use the phrase to describe eating outdoors -- that’s an American adaptation. In Italy, “al fresco” actually refers to spending time in jail. Yikes! The next time you find yourself strolling through the Piazza Navona in Rome in search of Carbonara, be careful who you ask about al fresco dining. I’m no etymologist, so I can’t tell you whether or not Wikipedia is pranking us on this one, but I can tell you this: One would never conflate the outside dining experiences available in Traverse City with time spent incarcerated against one’s will. In fact, al fresco dining in Traverse City is one of the most sublime full-sensory experiences that I can imagine. From family-friendly to a bit more formal, here are ten of our favorite al fresco dining (and drinking) options in Traverse City. It was hard to narrow our list down to just ten, but we had to draw a line somewhere! Just because an establishment did not make our list, it doesn&apos;t mean you should hesitate to check it out. Delicious burgers, shakes and fries -- need I say more? Slabtown Cafe and Burgers is located a little off the beaten path on West Front Street across from Division in the "Slabtown" neighborhood. If you’re visiting Traverse City, you’ll hopefully have a chance to dine in this fun westside neighborhood. Order your burger, grab some napkins, and enjoy the beautiful Northern Michigan weather at one of the restaurant’s outdoor tables. It’s also one of the best dining values in town - our family of five usually gets burgers, fries and a few milkshakes for under $30! The Filling Station is another family-friendly eatery that offers delicious flatbread pizzas and salads as well as house-brewed beers. It’s located on the north shore of Boardman Lake in an old train depot, just south of Downtown. The first time we visited The Filling Station (on vacation, before we moved to Traverse City) and ate outside, I admit I was a bit alarmed when I saw kids playing on the train tracks -- however once I learned that trains no longer run on the tracks, I let our kids join the mix. The tracks, coupled with the sandboxes and toys on the patio, make this restaurant a must-visit for families. The kids will be occupied and you might even get to enjoy a pint on the patio! 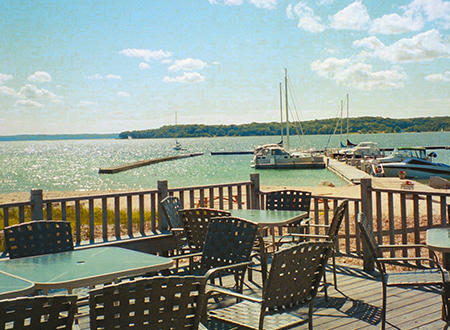 The Little Fleet is one of Traverse City’s hottest spots to have a drink while enjoying a meal in an outdoor setting. 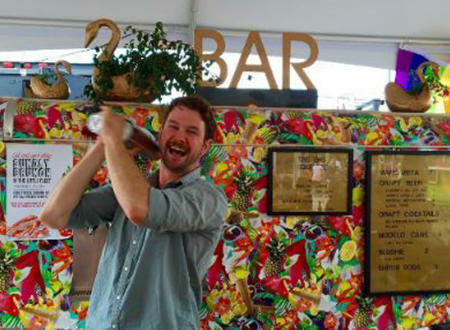 It does not actually serve food by itself, but rather it’s an open-air bar and food truck park where you can order delicious fare from an eclectic mix of micro-restaurants. If you have been to The Little Fleet during a previous visit but haven’t returned yet this summer, you’ll notice two big changes: the barrier separating the seating area from the food trucks has come down, so now you can stroll through the entire lot with a cocktail in tow; and, the lot now features a tented area with a beer truck, so you can get a beer on tap without venturing inside. The interior of North Peak Brewing Company is architecturally stunning. The restaurant is located in an old candy factory and the building features soaring ceilings, exposed brick and reclaimed wood. But, as much as we like the inside, North Peak’s outdoor patio is our favorite part of this westside downtown brewpub. Their pub fare is delicious, the beer is always cold and there&apos;s even a chance you may see live music during your visit. 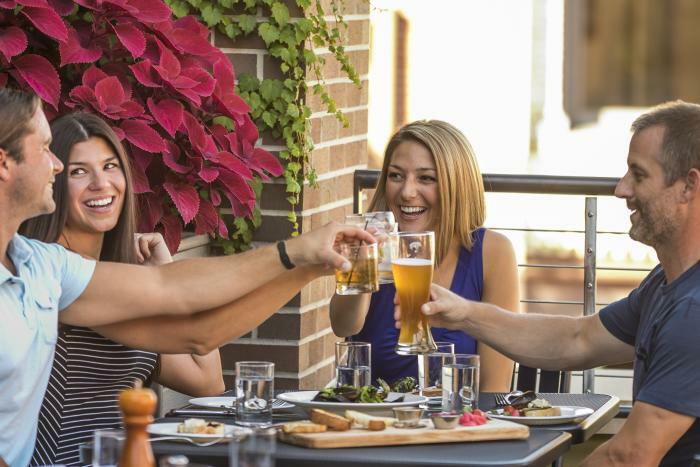 The Towne Plaza’s charming brick patio sits on the corner of Cass and State Streets and it is a perfect location for lunch or dinner after shopping Downtown. The restaurant is known for its delicious and locally sourced dishes, especially those made with pork. The menu is diverse with plenty of beef, poultry, seafood and vegetarian options. We recommend the slow roasted, pan-seared pork belly with fried green tomato and creamy Tabasco vinaigrette! The Franklin is located in the heart of Traverse City&apos;s Front Street district. 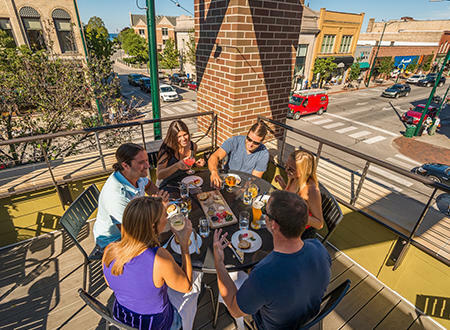 The rooftop patio overlooks the city and provides a glimpse of the beautiful Grand Traverse Bay. This view also showcases the historic and ornate architectural features that characterize our Downtown and its urban culture. The menu is diverse and features farm-to-table fare along with house-made cocktails. Whether you are heading to the beach at Clinch Park or planning a day of shopping, The Dish Cafe is an excellent option for grabbing a quick lunch, where you can choose from a healthy selection of soups, salads, sandwiches and quesadillas. There&apos;s also a delicious mix of smoothie and shake options. Outdoor seating is limited, but the turnover is quick so there&apos;s likely to be a table ready at any time. This bistro is a gem on the Old Mission Peninsula! The lakeside views and amazing steak and seafood are just a few of its highlights. After the drive up the peninsula, you will be ready to relax in one of their Adirondack chairs with a glass of local wine -- we always are! When it&apos;s time for dinner be sure to choose a table on the outdoor patio where you can indulge in sampling from the extensive oyster and other raw bar options. Amical has been dishing up eclectic European-inspired food for over twenty years in Downtown Traverse City! Enjoy a long lunch, pre-dinner cocktails and appetizers, or a full dinner on the patio. Look for the purple awning and the black and white checkered tablecloths, and you&apos;ll know that you&apos;ve found the right place. We love their Sunday brunch and especially enjoy their great service, wonderful food and friendly atmosphere. Just north of Traverse City on the Old Mission Peninsula sits the Mission Table and Jolly Pumpkin restaurants. Mission Table is the more formal of the two establishments and is also the one with the lovely outdoor patio. Order an artisan-crafted cocktail -- made with their own spirits -- and enjoy the complete farm-to-table experience. The view of Bowers Harbor isn&apos;t too bad either! Traverse City is, undoubtedly, one of the top “foodie” destinations in the country -- it has the accolades to prove it. And there’s no time like summertime to enjoy this town’s culinary delights. Food just tastes better al fresco.